Today's card was created with the Craft Your Passion challenge #251 in mind -- Anything Goes. I recently purchased the chalk board cs from SU! and the 3 chalk ink pads that coordinate. 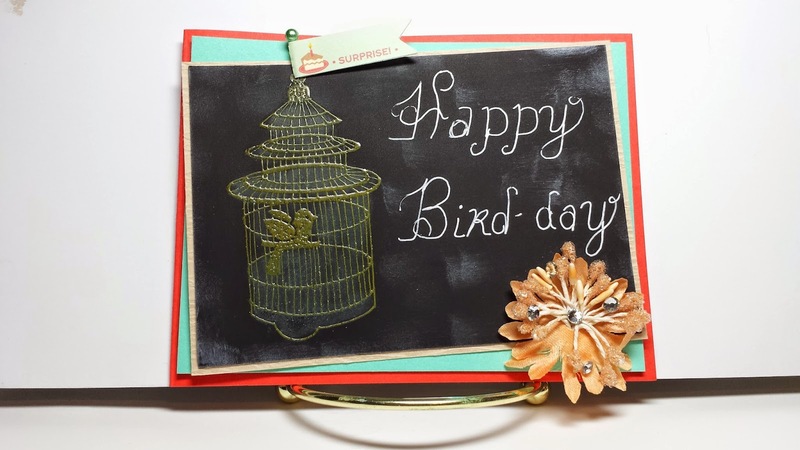 I stamped the Tiered Birdcage from Stampendous! with the Yellow Citrus chalk ink. Then I heat embossed with clear embossing powder. Added a jeweled flower from Jodie Lee Designs at Prima and a little banner from October Afternoon's Cakewalk Little Flyers. I matted the chalk board cs on a piece of craft cs then onto a piece of Coastal Cabana then onto my tangerine card base. With some white craft ink I smudged with a dauber just to give it that chalk smudged look. The sentiment is handwritten. Hope you like my card. If you want to play along with the challenge you can jump over to the blog from HERE. Labels: Anything Goes, bird-day, Chalk, Chalkboard, Coastal Cabana, Craft Your Passion, Happy Birthday, Jodie Less Designs, October Afternooon, Stampendous!, Stampin' Up! Very cute card! I love how you got the chalk smudges on there.